Barons’ October 26th event at Sandown Park was the second-best sale in the 12 years since Laurence Sayers-Gillan founded the classic and collectors’ car auction house. The star of the sale was the beautiful and extremely rare 1963 Bentley Continental 2 Door Coupe by Mulliner, which romped up to £159,000 gross after a protracted battle, which finally came down to a single bidder in the hall versus a telephone bidder, who was the eventual buyer. The packed hall burst into applause as the hammer fell. 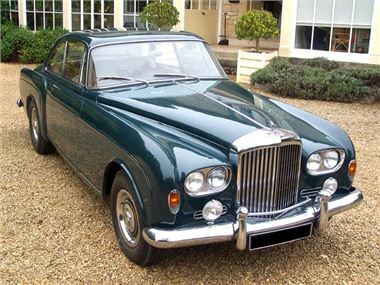 One of just eight examples built in right hand drive configuration, and one of only 11 built in total, the Bentley was in completely original condition. But while it may have been the ultimate star car, there were also some significant prices achieved for a pair of Jaguar E-type FHC’s. The lovely 1969 Series Two went for an impressive £31,860 gross and the 1967 Series One 4.2, a very healthy £53,000. In fact, Jaguars were very much in vogue on the day, with seven out of the top ten cars being representatives of this legendary marque. The event also saw the sale of a mint-condition SAAB Sonnet II V4, which achieved £9,790 gross. Barons’ auctioneer Fabian Hine admitted that he had never offered such a car in his 37-year career and most auction-goers had never even seen one. Barons’ Managing Director, Laurence Sayers-Gillan, commented, "This was an excellent result and was not only significant for the sale of the Bentley. With a total of over £544,000 and 37 cars finding new owners, the result was very good all-round."